After months of teases, Ikea and Sonos have finally lifted the curtain on their Symfonisk speaker collaboration. The debut lineup includes a speaker that doubles as a small bookshelf and a speaker lamp… yes, you read that correctly. While that might sound strange, the idea behind the products is to play to both Sonos and Ikea’s strengths in the areas of design and music performance. To that end, they’re designed to blend into your home or apartment seamlessly while still providing a solid sound experience. While we knew about the bookshelf speaker previously thanks to a first-look preview event, we now know that the shelf can hold about 3kg (6lbs), can be hung horizontally, vertically or attached to a kitchen rail. The table lamp, however, is completely unexpected and feels like peak Ikea in that it’s unique, functional and, well, surprisingly cheap. 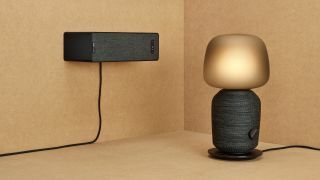 In terms of pricing, the Symfonisk Table Lamp will only run you $179 (around £140, AU$250), while the Symfonisk Book-Shelf will go for $99 (around £75, AU$140). Like other Sonos speakers, both speakers in the Symfonisk lineup connect to your Wi-Fi and can be controlled through the Sonos app. The Sonos app integration allows the speakers to join any multi-room setup you already own, or can lay the foundation for a new one. While neither Sonos nor Ikea provided a release date for the speakers, that information might come out of this week’s Feel Home event happening in Milan, Italy. If it does, we’ll be sure to update this story with that information.